If this winter turns out to be as robust as the past summer, then we can all expect to do a good bit of shivering and shaking in the next few months. And it’s likely to cost people more to heat their homes this year. Although everyone can benefit from weatherproofing and insulation, many people are taking their cost-savings initiatives a step further—looking for alternative forms of home heating. From stoves that burn wood or corn to radiant heating that warms the home through the floor, modern technology has given rise to a wide range of new home heating options to offset the high cost of oil and gas. 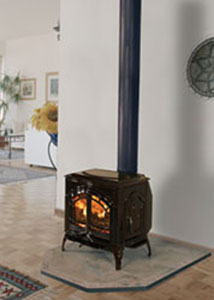 There’s a lot of difference in modern wood-burning stoves and the stoves that were found in homes 20 years ago. With home heating costs soaring, more homeowners are installing modern wood-burning stoves. But saving money isn’t the only reason to consider this time-honored method of heating your home. 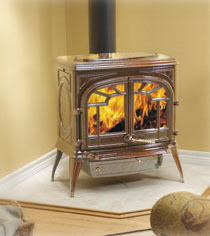 There is also an intangible quality of having a wood-burning stove as the center of your home. What could be more welcoming on a cold winter day than the warmth and glow of a crackling fire? Aside from the charm of a crackling fire, there is no similarity between wood-burning stoves today and those found in homes 20 years ago, says Thomas Morrissey of Woodstock Soapstone Company of West Lebanon, New Hampshire. “Today’s stoves are clean-burning and efficient—most of what goes up the chimney is just carbon dioxide and water vapor. There is virtually no smoke or odor,” he notes. 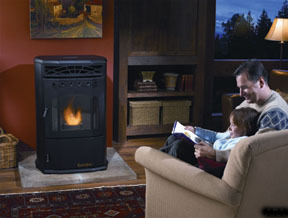 With modern stoves, there is virtually no smoke or odor. Multi-fuel stoves can burn wood, dried wheat or corn. Wood-burning stoves have been a home heating staple for centuries, but more recently, stoves that burn dried wheat or corn, or pellets made from dehydrated, compressed wood chips, have grown in popularity. Multi-fuel stoves are the first heating option that allows you to burn all three environmentally friendly fuels in the same stove. Like traditional wood or other single-fuel stoves, the multi-fuel stoves, when used as an alternative heat source for your home, can cut your energy bill by up to 70 percent, says Glenda Lehman Ervin of Lehman’s, an old-time general store founded by her father in northeast Ohio in 1955. “The Environmental Protection Agency rates multi-fuel stoves as the most energy-efficient stoves available,” says Lehman Ervin, who uses a Greenfire brand multi-fuel stove. “Multi-fuel stoves allow responsible homeowners to take care of the environment and their wallets at the same time,” says Lehman Ervin. Purchasing pellets, shelled and dried corn, or hulled and dried wheat can be cheaper than buying wood and easier than chopping your own free wood. These alternative fuels are good for the environment because they are made of endlessly renewable materials that do not contribute to climate change the way fossil fuels do. “You need to have the storage space for wood, and it takes a year to properly season wood for your stove,” Lehman Ervin notes. Wood must also be stored properly to ensure it is preserved and does not attract rodents or insects close to your home. Corn, wheat and pellets, however, require much less storage space and no special preparation or consideration by the homeowner. “Anyone who doesn’t have access to wood or who would prefer to avoid the chore of chopping it, or the risk of storing it in their home, would find a multi-fuel burning stove a versatile alternative,” she says. Like any stove, the multi-fuel stoves require a chimney. And the convenience of the alternative fuels makes a multi-fuel stove a good option for anyone living in a more urban area. Multi-fuel stoves cost about the same as a traditional wood-burning stove. However, fuel costs are less than buying wood and far beneath fossil-fueled heat. Dell-Point Europa, manufacturers of Greenfire stoves, cites a vast difference in average annual fuel costs: more than $1,500 per year for electric, $1,000 for oil and just $385 for corn. Portable heaters are great for a personal level of comfort, when one spouse is hot while the other is cold. There’s no doubt that the price of oil and heat this winter will shock our wallets. And heating bills are likely to continue to skyrocket, leaving less cash in the bank for other needs. According to the manufacturers of Honeywell heaters, the average annual cost to heat a house at 70 degrees is $1,700 (based on an average 1,500 square foot house)? It makes good sense to heat only the rooms in which you spend the most time, rather than the whole house. With a portable heater, homeowners can save hundreds of dollars annually. 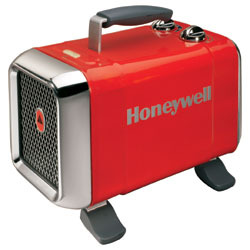 A broad line of portable heaters is available to help stay warm without the winter freeze of heating bills. Portable heaters can supplement your central heating, keep drafty basements or workshops warm and create a personal level of comfort in whatever room you’re in—a great solution when one spouse is always hot, while the other is always cold. And when lowering the temperature in a house by even one degree, consumers can save up to 2 percent in heating costs per year. When selecting a portable heater, be sure the unit has plenty of safety features. Know where you will put your heater to help decide on shape, color and style. And make sure your electrical outlet is safe and secure. Many homeowners have more than one portable heater, depending on where they want to supplement their heat. Family rooms and workshops are often where portable heaters are used. For instance, baseboard heaters are perfect for the family room with consistent, silent heating. But in the bedroom, you may prefer a ceramic heater with its focused broad heating. The following is a brief overview of the wide array of portable options to choose from. Ceramic—A ceramic heater provides quick, focused heating. It can be easily directed to send warmth where it’s most needed. Ceramic heaters are the most commonly purchased variety of heater and are available in several shapes and sizes. They are commonly used in sunrooms, workshops and small offices. Baseboard—Baseboard heaters are terrific to use in places where you do not currently have heat (like a basement or family room). They are quiet and heat the air in the whole room. Baseboard heaters are low-profile (short and line up against a wall) and are therefore less noticeable. Fan-Forced—Like ceramic models, fan-forced heaters provide personal, directional heating, creating currents of warm air that can be directed by the user. They are highly efficient at heating the exact space you are in. 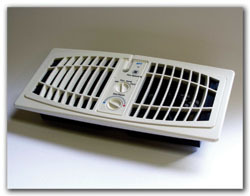 Fan-forced heaters are commonly found in bedrooms, offices and workshops. Radiator—A radiator heater efficiently heats the air in the room through ambient heat vs. a direct stream of heat. It is a popular type of heater because it simulates a traditional home radiator and blends nicely in most environments. It is widely used in basements and family/living rooms. 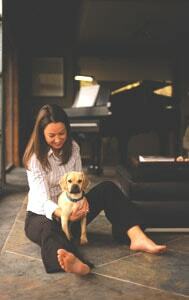 Radiant heat flooring radiates warmth outward to all areas of the room. It’s a fact of life: No matter how warm your house is, if your feet are cold then you feel cold all over. On the other hand, if your entire floor is heated to 72 degrees, then this large heated surface will radiate heat outward to all areas of the room. A heated floor coupled with a 70-degree air temperature does a great job warming you from head to toe, making the home comfortable enough for bare feet in the middle of winter. 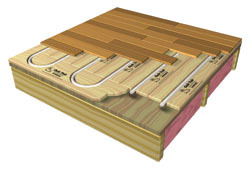 Radiant heatflooring is available in two types: electric and hydronic. Hydronic systems generally feature under-floor flexible pipe that carries hot water across the floor. The flowing hot water provides the floor’s pervasive warmth. These systems are usually installed in whole-house new-construction applications. Hydronic systems can be powered by gas, oil, electricity or solar energy, making them more flexible and economical than electrical systems for whole-house applications. Electric systems use mortar-embedded cable or thin under-floor mats that are wired to work much like electric blankets. These systems are often used to heat small areas such as kitchens, bathrooms and entryways. Electric systems are typically easier to install than hydronic systems. They work well in many single-room remodeling projects because many existing homes have electric heat, so it’s easier to maintain the same energy source. Whether hydronic or electric, radiant heat floor systems offer the popular combination of comfort and energy efficiency. The Radiant Panel Association, a trade organization for the radiant heating industry, estimates that these systems can reduce a home’s energy usage by 25 to 30 percent when compared to forced-air systems, because they use direct heat rather than air currents. Silent operation is another bonus. And because these systems are free of the drafts associated with traditional ducted heating systems, they also keep indoor air cleaner by not circulating dust like forced-air systems do. For commercial use, you might consider an alternative such as infra-red heating. Unless otherwise indicated, infra-red heaters are not certified for residential use or where flammable gasses or vapors are present (such as spray booths). But for private business owners, infra-red heating works well in wood shops, pole barns, auto shops, warehouses or even home garages. According to Detroit Radiant, independent studies reveal that gas-fired infra-red heating can save 20 to 50 percent in fuel consumption over forced air heating. The two types of infra-red heating are High-Intensity and Low-Intensity. High-intensity heaters have been around since the 1950’s. These types of heaters require high mounting heights due to an open flame that covers a ceramic surface. High-intensity heaters also have a reflector to help direct the heat where it needs to go. These are used to spot heat areas with few workers and are typically unvented. 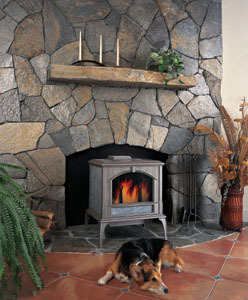 This Built-In Electric Fireplace from MantelsDirect.com is designed for easy installation in new construction, remodels or existing fireplaces. The zero-clearance design allows flush-mounting to drywall, tile or installation into a finished cavity. Available in 33- and 39-inch sizes, this electric fireplace features a realistic hand-carved log set, glowing logs and a fully viewable fireplace area. User-friendly controls are easily accessible and a multi-function remote control is included. 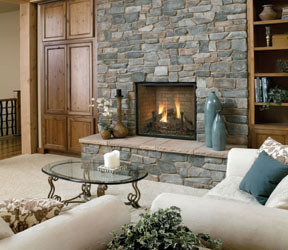 Electric fireplaces make a great alternative heating source. This unit can be wired with either 120- or 240-volt service, allowing the units to produce 5,000 or 9,200 Btu’s. Visit www.mantelsdirect.com for more information. The AirFlow Breeze works with your existing central heating and cooling system, drawing additional air to the problem areas in your home. Once you set your target comfort level, the built-in temperature sensor takes over. It will direct the powerful, yet quiet fan to pull extra warm or cool air out of weak registers, increasing air flow, and delivering the comfort you demand. By improving the air flow from your existing central heating and cooling system, the AirFlow Breeze provides an affordable alternative to space heaters, costly attic fans and complex zoning systems. Visit www.aftproducts.com for more information. What room in your home has a noticeable chill in the morning? If you answered “the bathroom,” you’d be like most of us. If you could quickly warm up your bathroom without turning up the heat in the rest of the house, imagine your energy savings. Cadet Manufacturing has just introduced the Com-Pak Bath Heater, which allows you to do just that. 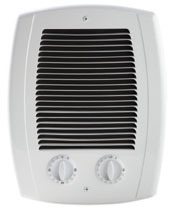 This new in-wall electric fan heater provides instant heat and warms the entire bathroom area. It comes with a built in 60-minute auto-timer, which overrides the built-in thermostat setting for instant heat, providing you with peace of mind and convenience. The slim profile grill allows the heater to blend into your space and décor. The Cadet Com-Pak Bath Heater is available in 1000 Watts, which shouldn’t overload most bathroom circuits. It can be configured for either 120- or 240-volt applications with a quick switch of a wire. Visit www.cadetco.com for more information. For anyone who is thinking of cutting the winter chill with a couple of extra sweaters, the Hearth, Patio & Barbecue Association (HPBA) of Arlington, Virginia, has good news. People can reduce monthly heating expenses by installing a hearth product, such as a freestanding stove or a fireplace insert, as a secondary heater for the high-use zones of a house. The concept of zone heating with a hearth product has the greatest potential for cost savings when people add a wood or pellet-burning stove, or fireplace insert, because of the cost of the fuel. This past winter firewood was approximately 61 percent less expensive than electricity and around 20 percent less than oil and natural gas. The savings with pellet fuel was also significant. The addition of a gas stove or gas fireplace insert can also provide home heating relief because these state-of-the art hearth products operate with greater efficiency than many older gas furnaces in homes today and do not lose heat through inefficient ductwork. Determine the zones to heat: Taking an inventory of the rooms most used in a house to help determine where to concentrate heat for the most comfort. 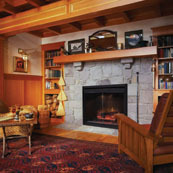 Update an existing fireplace: Most traditional fireplaces are a major source of energy loss. If the chosen zone has a fireplace, adding an energy-efficient fireplace insert can turn the fireplace into an effective heating source. Add a freestanding stove: Kitchens, living rooms and family rooms without fireplaces are good candidates for freestanding stoves. Most stoves are compact and can easily be installed in rooms with limited space requirements.